Atos, a global leader in digital transformation, launches BullSequana S, its new range of ultra-scalable servers enabling businesses to take full advantage of AI. With their unique architecture, developed in-house by Atos, BullSequana S enterprise servers are optimized for Machine Learning, business‐critical computing applications and in-memory environments. In order to utilize the extensive capabilities of AI, businesses require an infrastructure with extreme performance. BullSequana S tackles this challenge with its unique combination of powerful processors (CPUs) and GPUs (Graphics Processing Unit). The BullSequana S server’s flexibility leverages a proven unique modular architecture, and provides customers with the agility to add Machine Learning and AI capacity to existing enterprise workloads, thanks to the introduction of a GPU. Within a single server, GPU, storage and compute modules are mixed for a tailor-made server, for ready availability of all workloads worldwide. BullSequana S combines the most advanced Intel® Xeon® Scalable processors - codenamed Skylake - and an innovative architecture designed by Atos’ R&D teams. It helps reduce infrastructure costs while improving application performance thanks to ultra-scalability – from 2 to 32 CPUs - with innovative high capacity storage and booster capabilities such as GPU (Graphics Processing Unit) and, potentially other technologies such as FPGA in further developments. “Atos is a prominent global SAP partner delivering highly performant and scalable solutions for deployments of SAP HANA. We have been working together to accelerate SAP HANA deployments by providing a full range of SAP HANA applications certified up to 16TB. The new BullSequana S server range developed by Atos is one of the most scalable platforms in the market, optimized for critical deployments of SAP HANA. It is expected to open new additional collaboration areas between SAP and Atos around artificial intelligence and machine learning,” said Dr. Jörg Gehring, senior vice president and global head of SAP HANA Technology Innovation Networks. Up to 32 processors, 896 cores, and 32 GPUs in a single server delivering an outstanding performance and supporting long-term investment protection, as capacities evolve smoothly according to business needs. With up to 48TB RAM and 64TB NV-RAM in a single server, real‐time analytics of enterprise production databases will run much faster than on a conventional computer by using in‐memory technology whilst ensuring both security and high quality of service. With up to 2PB internal data storage, BullSequana S efficiently supports data lake and virtualization environments. 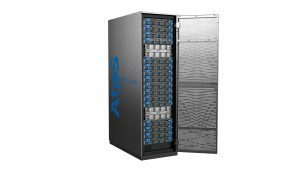 “To power Machine Learning and AI in enterprise IT, Atos has designed a new-generation computing platform, which accelerates our customers’ digital transformation by converging business‐critical computing and HPC within a single device. BullSequana S is the ultra-scalable, ultra-flexible, go-to server that delivers extreme performance while optimizing investment”, underlined Arnaud Bertrand, Fellow, Head of Big Data and HPC at Atos. The first BullSequana S machines manufactured at France-based Atos factory are available worldwide from today.